Want to win a Super Bowl? Stop trying to be perfect. New Years Eve. Prom. Seeing any movie in 3D (until GRAVITY). What do each of these things have in common? They all, regardless of hype, underwhelm. At least in my experience, the lead-up to each of these events is always much more exciting than the actual affair. The Super Bowl, however, has never been on the above list. Sure, I’ve been disappointed by the outcome of various games (I’m looking at you Rex Grossman), but the journey through four quarters has always been an exhilarating ride that overshadowed weeks of media madness leading up to kickoff. Not true of Super Bowl XLVIII. What a bust. Even worse, what a shame. I woke up this morning legitimately bummed and irrationally peeved about the Super Bowl. You see, in the five days preceding the Big Game, I appeared on numerous sports radio shows and podcasts. The time I spent studying and prepping for each of those appearances far outweighed my time behind the mic. I dug up stats, memorized quotes, and crafted a truly expert analysis of what I thought would go down on February 2nd. On each show, I mentioned the Percy Harvin factor, how the bounce he gave Seattle’s offense in the Divisional Playoff game against New Orleans shouldn’t be overlooked. Heck, I even noted his special teams abilities. It didn’t stop there, though. I went on to praise Bobby Wagner and talk up Cliff Avril, warning that the Seahawks pass rush had the potential to get after Peyton Manning and throw his three second release off-kilter. I’m pretty sure I was one of the only independent analysts to point to Brandon Mebane as a key to stopping Moreno and Denver’s running game. Yet, despite all of this love for the Seahawks, when asked which team I thought would hoist the Lombardi Trophy at the end of the night, without hesitation I confidentially answered, “The Broncos.” Cue the gut punch. I, like most people, revere Number 18. Despite having never lived in Indianapolis or Denver and regardless of the fact that he outscored my Bears by 12 points in Super Bowl XLI, I effing love the dude. I sincerely believed that this was going to be the moment for Peyton Manning. The moment that all of the dedication, hard work, and awww-shucks-good-guy-ness would payoff. The moment that he could stop being compared to his sweet-hearted, mouth-breathing, puppy of a little brother. The moment people could stop calling him “the best regular season quarterback of all time.” The moment he would become clutch. That made me feel good and hopeful; as if there was some sort of rational and celestial order to things. And then I saw it happen. We all saw it happen on the very first snap of the game. It was the look in Peyton’s eyes as the football soared over his shoulder into the Seahwaks endzone. He was thinking too much. He wasn’t fluid. My stomach sank. I knew this was going to become the wrong kind of ugly. 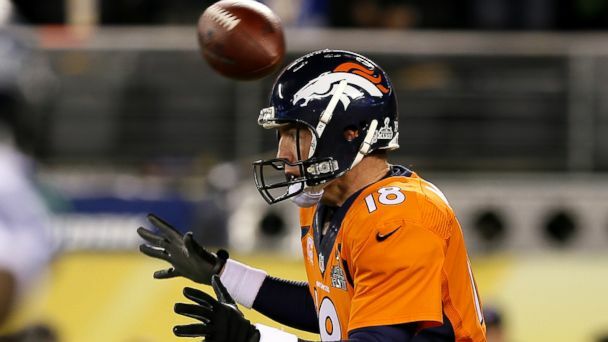 Peyton Manning is brilliant, but last night he wasn’t sharp. Peyton Manning is excellent, but last night he wasn’t exceptional. Unfortunately for Denver, they weren’t “smart” enough to know the answer.